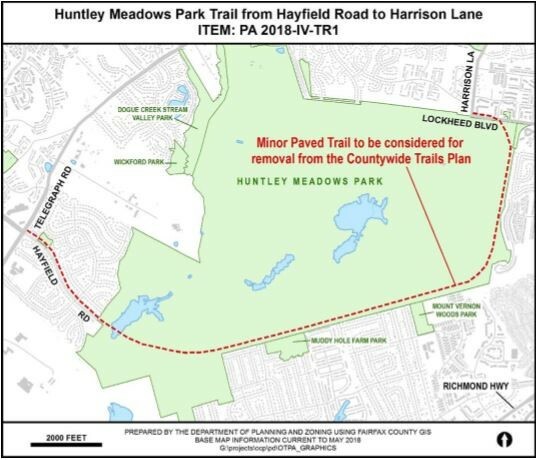 This fall, the Fairfax County Board of Supervisors will be voting on changes to the County Comprehensive Plan, and Huntley Meadows Park (HMP) will be part of that discussion. It helps to understand what a County Comprehensive Plan is. It is a plan document required by state law to be used as a guide in decision-making about the built and natural environment by the County's Board of Supervisors and other agencies, such as the Planning Commission. Sections of the Comprehensive Plan can be updated periodically through County Comprehensive Plan Amendments, if approved by the Board of Supervisors. Changes have been recommended to the Comprehensive Plan by Lee District Supervisor McKay, and I’d like to share the details with you. The two Plan Amendments proposed by Supervisor McKay request removal of two conceptual bike trails (on a plan but not built) through HMP. The images included in the newsletter show these conceptual bike plans. 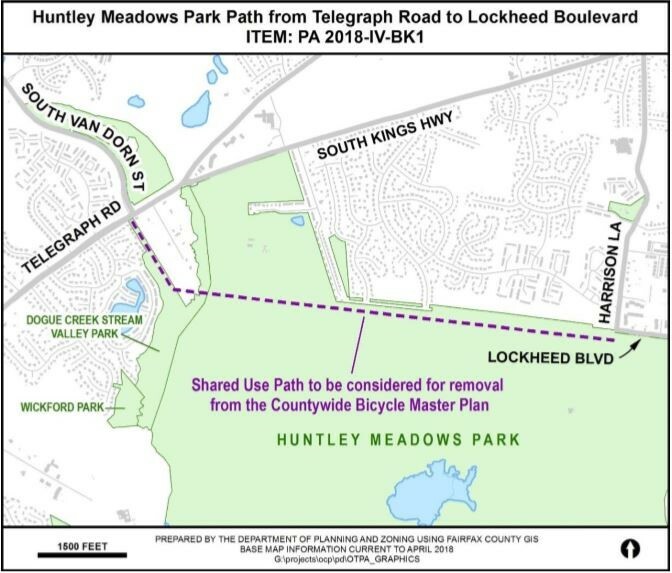 These conceptual bike/hike trails were conceived in 1975 shortly after the land for HMP was transferred from the federal government to the Fairfax County Park Authority. A Park Master Plan was created in that same year that outlined these trails. The trails were then incorporated into the County Comprehensive Plan. At the time of the transfer, the land comprising the Park showed little of the resources we now enjoy. Since the 1975 land transfer, changes to natural resource management and beaver activity in 1978 that dammed a creek in the Park, natural areas have rebounded. It was these beavers that created the Park’s central wetland, which continues to thrive in the same location today. Over the years, the Park Authority has and continues to assess, manage and document the natural and cultural resources at HMP. Wetlands, rare plants and rare animals exist in significant numbers/amounts along the bike routes. Unconsolidated soils in the southern and western portion of the Park have a water table at or just below the surface, often within 3-4 inches of standing water lasting a significant portion of the year. The ecological and engineering constraints including flooding and unconsolidated soils make it unsuitable for trails. Dogue Creek is designated VA Department of Game and Inland Fisheries (DGIF) Listed Threatened and Endangered Waters. The upstream watershed of the restored Central Wetland would be impacted. Historic resources, including those associat-ed with George Washington, exist. 1. Planning Commission public hearing will be held Thursday, September 27 at 7:30pm. 2. Board of Supervisors public hearing will be held on Tuesday, October 30 at 4:00pm.